Our ferry from Wrangell to Skagway departed at the insane time of 2:30 AM. These ferries depart and arrive at the craziest times staying only a few hours at most ports. Trying to schedule a trip through the Inside Passage can be difficult given the whacky schedule. 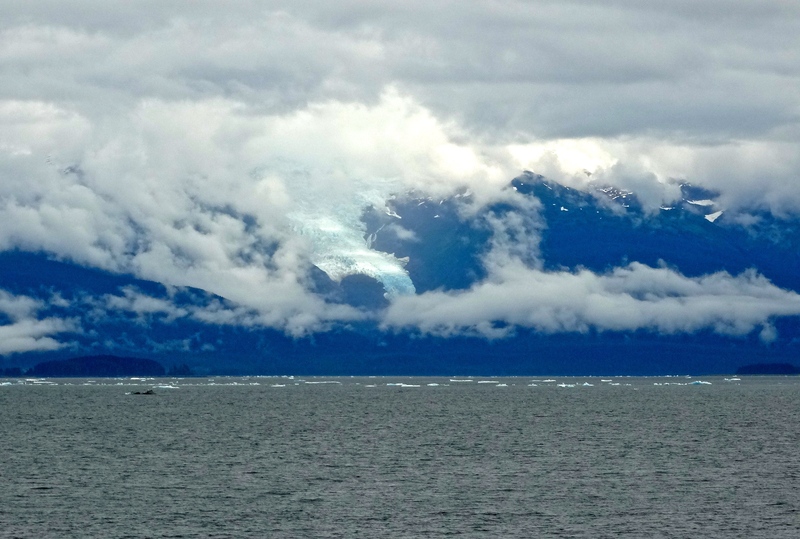 We wanted to spend time in Gustavus visiting Glacier Bay National Park but it would have added almost an additional week to the time traveling through the Inside Passage. Since we’ll never be able to see everything on this trip much will be left for future travels; Glacier Bay National Park will be on that list. 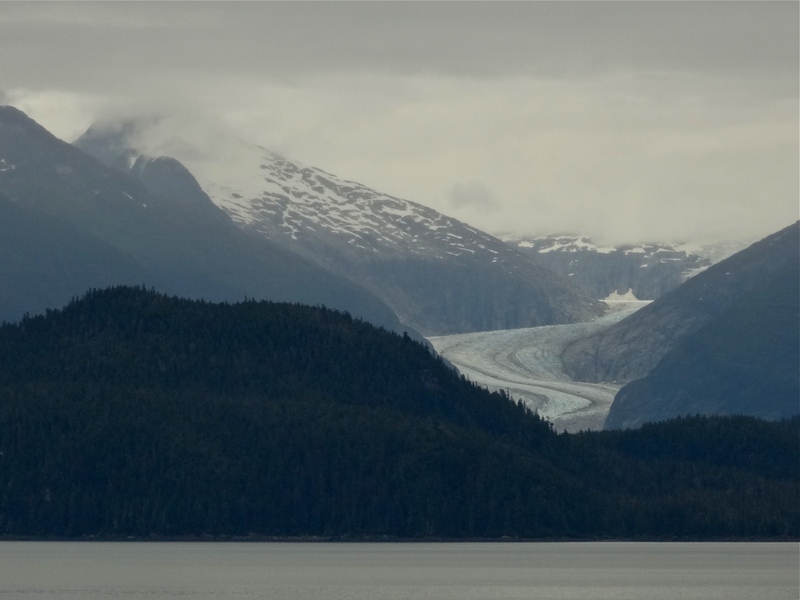 During this section of the Inside Passage from Wrangell to Juneau then onto Skagway we saw many glaciers in the distance. Icebergs from the glacier seen in the distance. The ferry slowed to a crawl as it passed through this section. There was almost a three hour stop in Juneau so we decided to share a van ride into town with a few other couples. We had enough time to walk around the small downtown area which was jam packed with jewelry stores and fur stores. 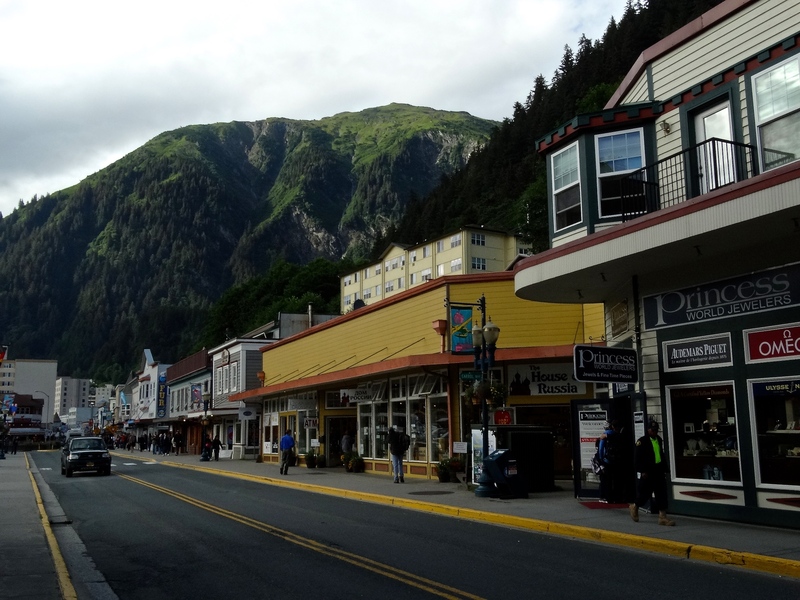 As we were walking through town we noticed that there were blue sheets of paper taped to the front windows of a few shops announcing that that they were Alaska owned shops. Our only guess was that many of the shops were owned by the cruise lines. Since I wasn’t in the market for jewelry or fur, I didn’t do much shopping! We did have lunch at one of the restaurants which was a welcome change to the ferry food service! How many jewelry and fur shops does a place need? These were cruise ship shops for their tourists. Back on the ferry we spent the rest of the evening enjoying the views and exchanging stories with our fellow passengers. One of the many glaciers that we saw on in the Inside Passage between Juneau and Skagway. 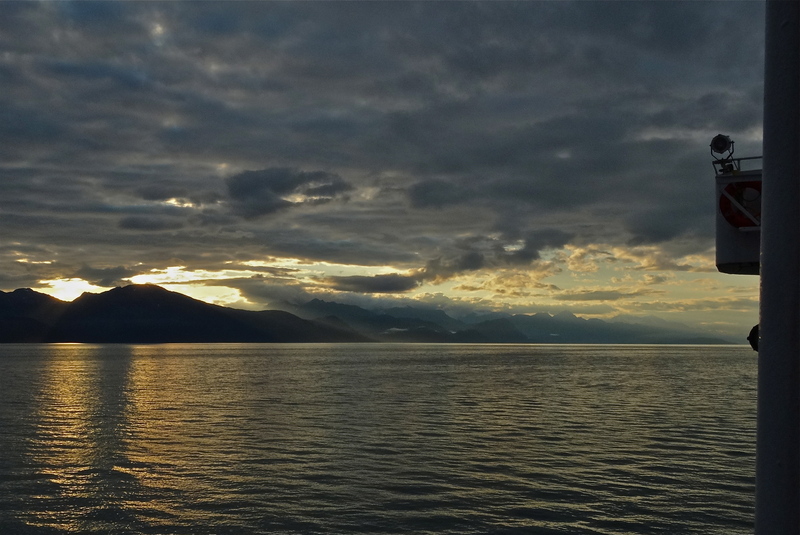 Just another stunning sunset on the Inside Passage! 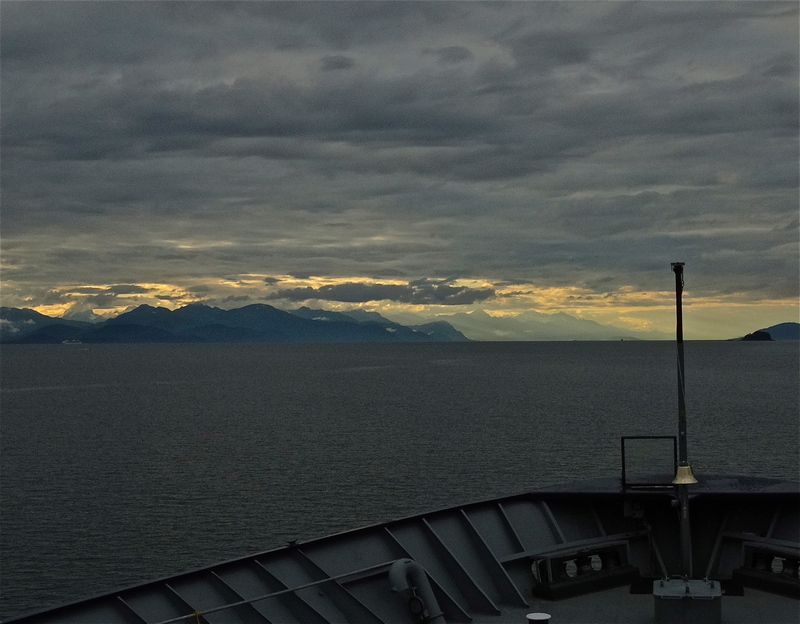 We spent our days in awe watching the changing landscape on the ferry through the Inside Passage. The mountains looked like ice cream sundaes with cherry clouds set aglow by the sunset. We arrived in Skagway at 4:40 AM. Did I tell you that these arrival times were crazy!? We feel so guilty driving our very loud diesel truck into RV campgrounds so early in the morning. We couldn’t find any open spots at the first RV campground where we had “reserved” a spot so we went to Pullen RV park right next to the marina and found an empty spot. Before arriving in Skagway the plan was to stay 3-4 days but once we walked through town and realized it was very much a cruise ship port of call tourist town we decided that two days would be more than enough. The beautiful Dewey Lake Trailhead started just a few feet from the RV park entrance. This was a perfect place for a run! We certainly aren’t racking up the miles that we once ran but the terrain is much hillier and more technical than anything we ran in the Bay Area. We took a break during the run to watch some people jump 30 feet into the cold waters of Lower Dewey Lake. 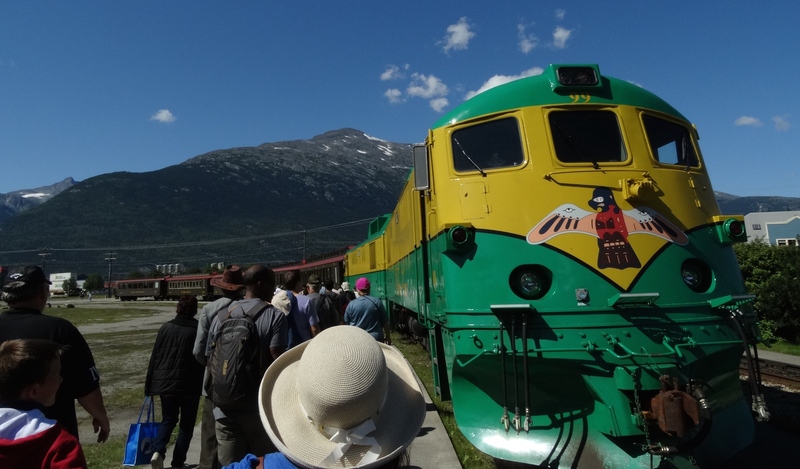 We spent the following day on the White Pass & Yukon Route train tour. Our experience with tours is a bit spotty but we continue to go on those that we feel have the potential to expose us to something that we wouldn’t see otherwise. 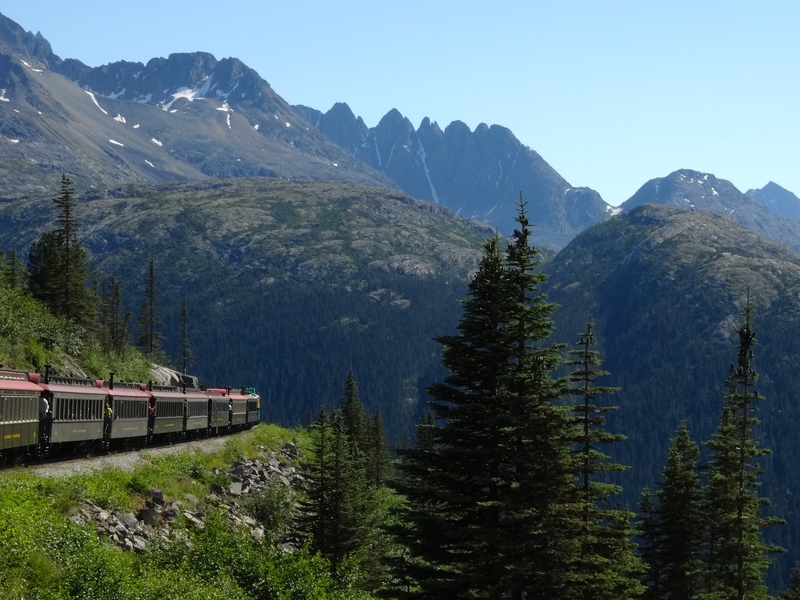 In this case, we heard that this narrow gauge train ride would take us through some of the most scenic areas of Alaska and the Yukon Territory. The scenery along the railway was breathtaking and considering the challenges of building this railway in 1898 makes it an engineering marvel. Riding the train hugging the mountain sides felt as if we were suspended in air. Looking out the window you could see that the width of the path for the train was only as wide as the train. 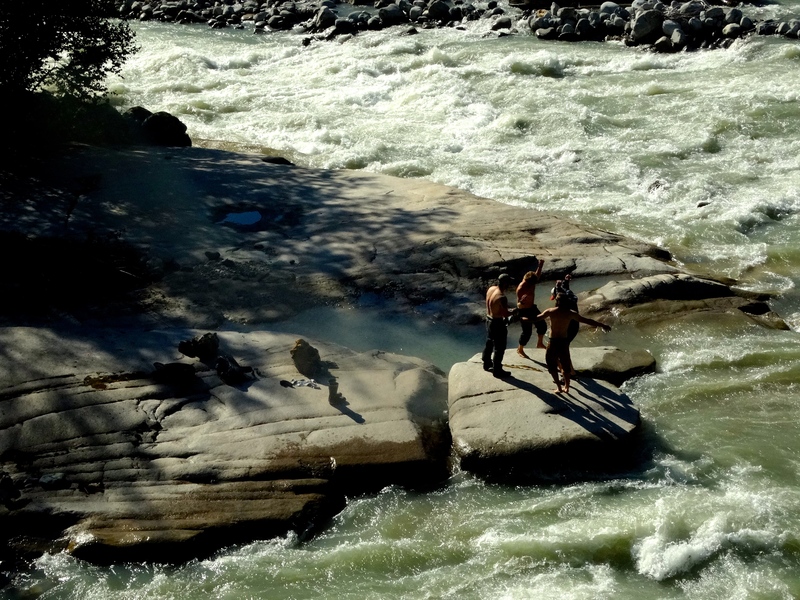 There were waterfalls and canyons, mountains and a river with class 7 rapids that have never been navigated. The route is an out and back which created a lot of discussion at the beginning of the trip with people strategizing as to which side to sit for the best views. People really never grow up! There was one man who shoved his way ahead of the crowds trying to get the best view. All of this was unnecessary since once we hit the end of the route the engineers move the engine from the front of the train and put it in the rear of the train making it the new front on the way down. All passengers switch sides and flip the back of the seats to the other side so we all face forward. If you followed all of the it means that if you were on the cliff side during the ride up the mountain then you have a canyon view on the way back down. No need to trample over your fellow passengers to get the best view! We did the White Pass Summit Excursion on the White Pass & Yukon Route Railroad. The views were spectacular along the tour. Tourists hanging out on the platforms between the rail cars on the train ahead of us. These guys did a happy dance for the tourists as we passed by. The earlier trains would drop people off who wanted to hike for the day. 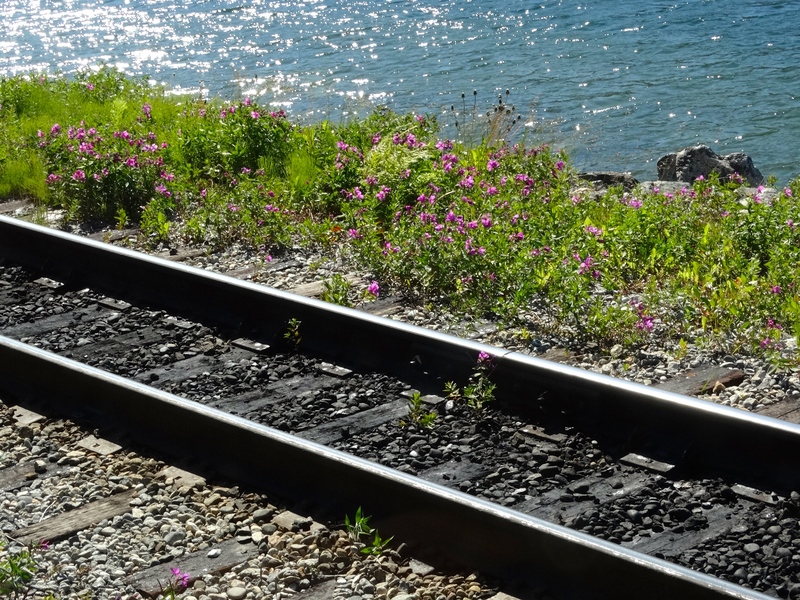 The last train would pick them up to return to Skagway. The rail line was practically obsolete at the time of completion since it was completed during the waning years of the gold rush. Most prospectors couldn’t afford passage by rail anyway! They could barely meet the Canadian Border Patrol obligation that all prospectors have 2 tonnes of supplies with them before entering Canada thus ensuring that Canada would not become burdened with an onslaught of prospectors that couldn’t survive the trip to Dawson City, the gateway to gold country. I can’t imagine the force of will of these men and woman who pursued golden dreams of riches. This is rugged terrain and they were carrying their loads on foot, horseback and dogsled through all types of weather. After the train ride we had a late lunch and then started our next leg of the journey to Whitehorse in the Yukon Territory of Canada. 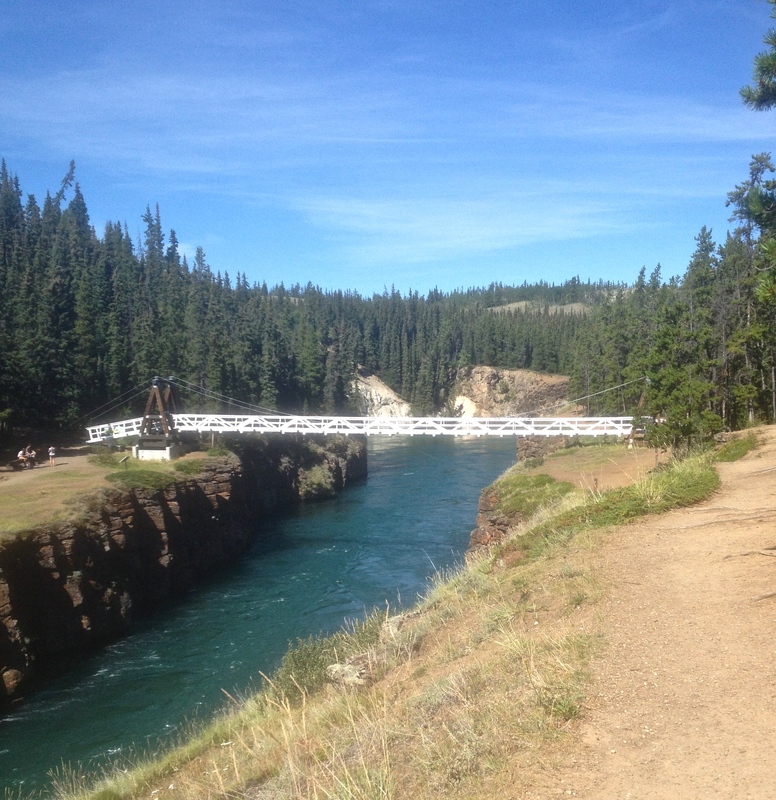 Once we arrived at Whitehorse we spent some time trying to find a secluded spot to spend the night. We saw on the GPS that there was a promising looking road along the river so we tried to find somewhere inconspicuous to park. We found what seemed to be a promising area and when we rounded the bend we were shocked to see Looking4Adventure‘s rig! We were in the middle of nowhere and ran into the same couple that we met back in March in Death Valley! They were actually out for a walk so we didn’t get to say hello. We left them to their awesome spot, not wanting to ruin their privacy. We gave up on finding anything special so went to the local RV park. I was a little surprised that there wasn’t anyone around to check us in but Darryl gently let me know that it wasn’t unreasonable for an RV office to be closed after 11 pm! With almost 20 hours of daylight my internal clock was completely off! The next morning we went for a run at the place where we saw Looking4Adventure. Unfortunately they had already left but it was a beautiful run along the Yukon River. “One fish, two fish” art exhibit coordinated in 1999 by local artist Donald Watt to commemorate the 50th anniversary of the fish ladder. 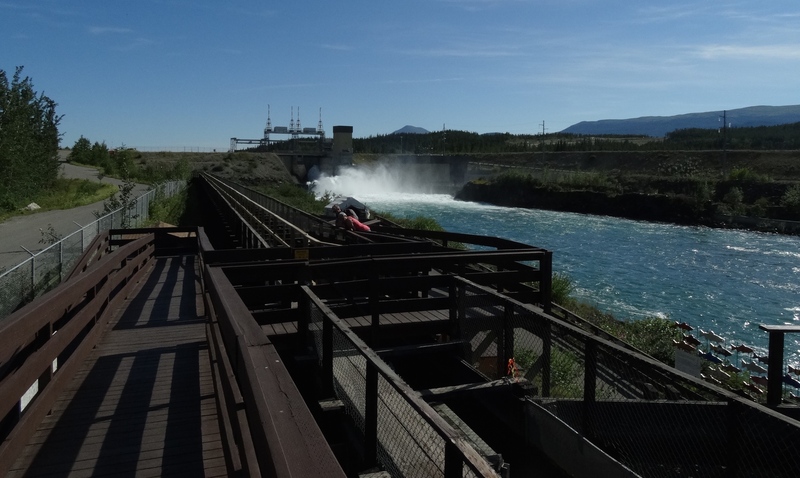 World’s longest wooden fish ladder in Whitehorse, Yukon Territory, Canada. Only 1,597 salmon passed through it this year of which 372 were wild salmon. The remainder were fish hatchery salmon. 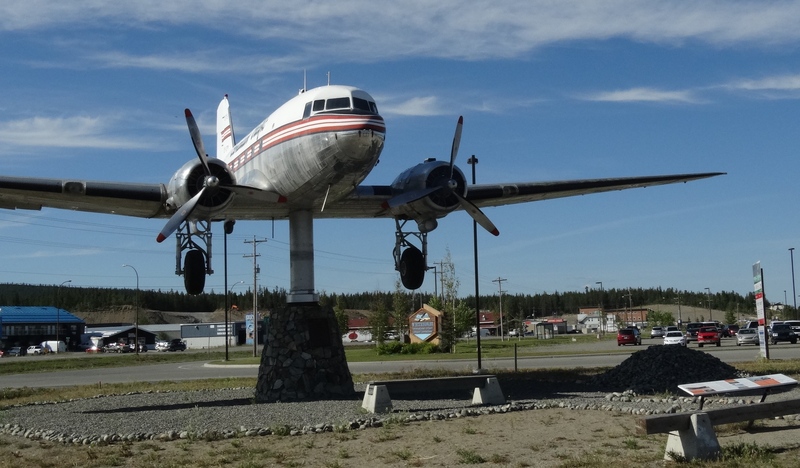 The next world’s largest is this DC-3 weathervane. I just wanted to drive by it to see it but since we were there we decided to visit the Yukon Transportation Museum where it was located. I found it fascinating to see the evolution of transportation in the Yukon covering rail, dog sleds, vehicles and aviation. Possibly the world’s largest weathervane is this DC-3 which is mounted to point into the wind. 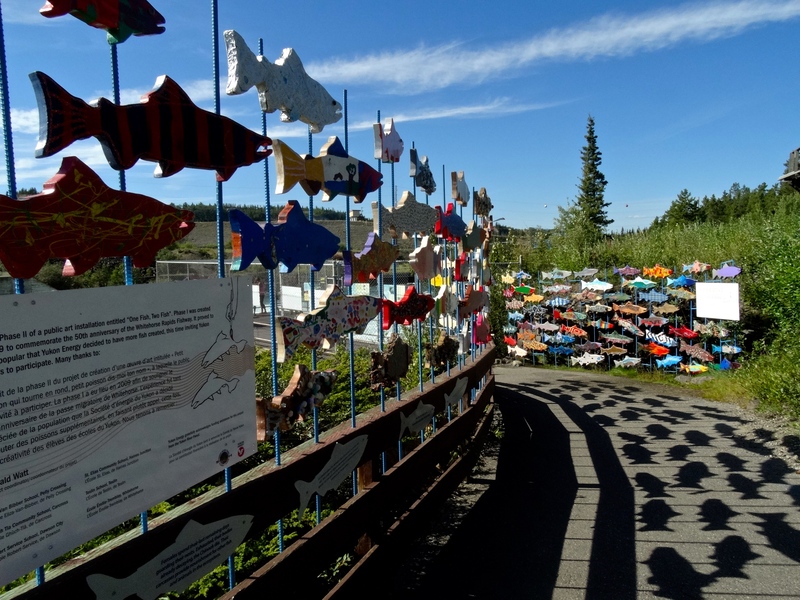 It’s installed at the Yukon Transportation Museum in Whitehorse, Yukon Territory, Canada. We would continue our own little journey through the Yukon onto Tok, Alaska in our comfy XP Camper. Next post Tok and Chicken, Alaska!